Automating your factory may seem like an overwhelming thought, but Engineered Vision can guide you through the process to stay competitive on the global stage with the constant evolution of technology. In order to survive as a business, technology implementation is critical. Many factory automation systems can be put in place to help businesses eliminate downtime, improve quality, quantity, safety improvements, and even increase job opportunities and positions within the manufacturing process. Factory Automation is a broad concept and can take many forms and has wide-reaching impacts of increasing capacity, lowering costs, and improving quality. It is the utilization of intelligent machines where the job is more suited to a machine, providing better operational workstations and tools when the position is best suited for a person, and interconnecting these machines, operators, and process to the Industrial Internet of Things (IIOT). Engineered Vision works with businesses to help them find their problem areas and create an automated system using Robots, Vision, and Custom Machines to take your factory to the next level. Engineered Vision will complete a free factory automation analysis and provide a report with how automatable your process is, equipment that could be utilized, and an estimated Return on Investment (ROI). 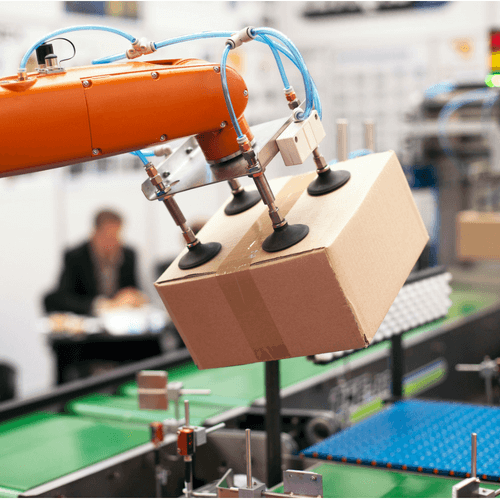 Businesses who utilized factory automation with our robots saw a return on investment that averaged less than one year with some even receiving a complete payback within 60 business days. We want to help you design your businesses of the future by providing the highest quality factory automation service, period. Engineered Vision has compiled a short list of details to help those who are unaware of the vast benefits of factory automation and how the World's #1 Robot can help! A common misconception we find with many of our clients is the thought that Our Robots and our factory automation service removes jobs from the business by utilizing them. Engineered Vision is here to let you know that not only does our factory automation supplied with our robots create jobs, it also helps workers get further training that can be utilized throughout their career. With the increase in training, higher level paying jobs are needed to maintain a growing business, which in turn is passed onto the worker. Technological advancement is inevitable and Engineered Vision can train your current workforce to utilize this technology to make their jobs more efficient and the company more profitable through tools like collaborative robots. One of the common problem areas Engineered Vision sees on a daily basis is how to create a productive manufacturing line without having to sacrifice quality or vice versa. With the use of our Factory Automation service and our robots businesses no longer need to worry about that. Meticlulous planning, equipment specification, and precision programming goes into every one of our factory automation projects to improve production quality, equipment reliability, and capacity. Methods that used to take hours making sure measurements were accurate now take mere seconds through the use of Machine Vision technologies. Workers are now freed up to do other tasks while increasing the line production with more top quality products at an accelerated rate. The safest solution for your business is always the one where you are spending less and making more and Engineered Vision knows how to create this exact situation for each company we serve. We use the World's #1 Robot when we integrate factory automation and because of that businesses receive Collaborative Robot automation that creates not only an ROI in less than a year but also establishes a higher production quality and shorter time frame that will increase production output. Labor costs become minimal, decreasing the amount of money spent on human workers and thus saving the company money. This increase of the production is then creating a faster turn out of products, in turn, creating a cheaper overall production cost. Engineered Vision's Factory Automation provides an unrestricted decrease in total expenditures while producing a higher output in production and quality. Engineered Vision knows that it is challenging to design every operational task with 0% chance of injury including physical and environmental. The typical operator does not want to complain about unsafe situations and feels the stress of keeping the business running, even in an organization with a World Class Safety Culture. It is the responsibility of management and safety personnel to identify and fix these shortfalls and implement technologies that remove these risks including ergonomics, repetitive movements, pinch points/presses, heavy lifting, and environmental hazards. Aside from removing the worker from an unsafe situation, both cycle time and accuracy can be improved. All of the processes that used to be dangerous, dirty, or hazardous including Nuclear Facilities, Underwater, Molten Steel, Swinging Objects are now safely done with co-bots and sophisticated factory automation technology. What is the glue that holds factory automation together? While every process in factory automation is essential and specific to all kinds of industries, what keeps all of this together is IIOT. 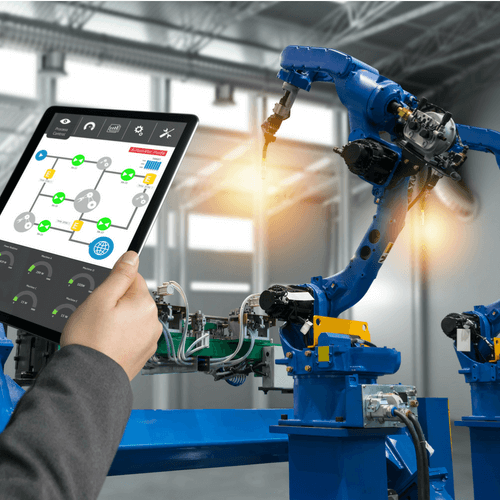 Known as the Industrial Internet of Things, IIOT is a mixture of machines, sensors, and the internet that provides a whole new form of manufacturing to a wide variety of industries. Engineered Vision utilizes IIOT applications through PTC ThingWorx. 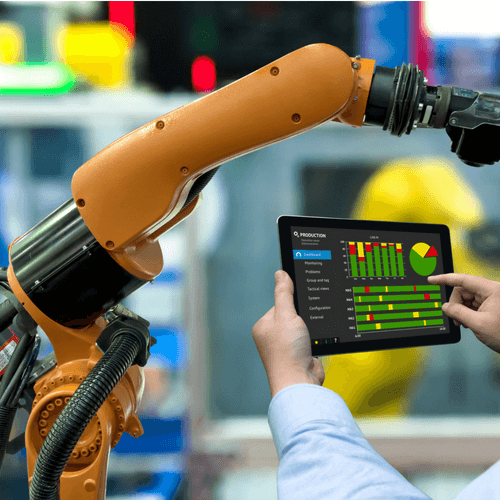 Combining the Innovation of Engineered Vision and the smart machine manufacturing of PTC ThingWorx IIOT applications factory automation is easy to integrate and maintain.